Who wouldn't enjoy having a cup of freshly brewed coffee with a view of the beach? Miss Philippines Rachel Peters didn’t win the crown, but she did snag thousands of hearts with her confidence, grace, and beauty. With the closing of another Miss Universe chapter, we can only look forward to the things Rachel will accomplish as Binibining Pilipinas-Universe and as a young entrepreneur. 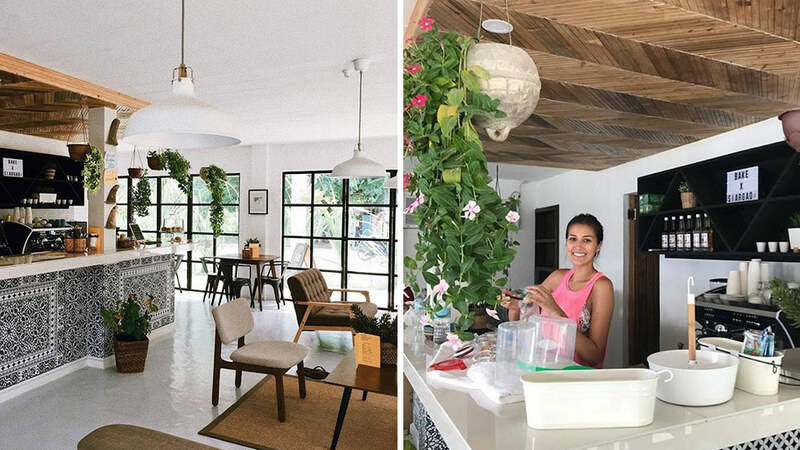 Many don’t know, but the beauty queen recently opened Bake by Hideout, a charming coffee shop by the beach in General Luna, Siargao Island. While completing her bachelor’s degree in La Trobe University in Australia, Rachel learned how to be a barista so if you’re visiting in the future, you might catch her whipping up drinks behind the bar. 1. The color palette and chosen textures evoke warmth. Wooden tables, upholstered chairs, and woven accessories come together to create a special place where one can unwind with a cup of joe and a view of the beach. At Bake, each table has a woven napkin holder and a small potted plant in a basket. Since the dominant colors are mostly neutrals, the coffee shop looks extra relaxing. 2. The bar's ceiling has an interesting pattern. Instead of leaving the ceiling as is or with plain-looking wood, a pattern can be seen—the repetition of wood strips makes it interesting and far from being boring. It complements the wooden accents in the cafe as well as the countertop. 3. Glass doors and windows let in natural light. No one wants to spend hours in a dark and gloomy coffee shop. Bake has glass doors and windows to let in natural light as well as to give customers a view of the outdoors. After all, Siargao is a scenic place to be, it's a delight to see the beach while sipping your favorite drink. Find similar lighting pieces at Home Cartel. 4. It's the perfect hangout—whether you need to work, study, read, or simple indulge in your passions. Whether you need a place where you can work, paint, or read a book, Bake has spacious tables for your gadgets and must-haves. With the cozy ambiance, you'll surely get work done in a snap. Thanks to the view, we're sure you'll feel inspired too! Find similar tables and chairs at Match Contract. 5. It has a well-thought-out interior—from the plants and building materials, to the furniture and accessories. Instead of sticking to an ordinary veneer or stone facing, the cafe features lovely tiles for the bar, giving it a glam upgrade. The tiles complement the neutral pieces and wooden accents in the space. Aside from having square tables where guests can work or study, there are tables meant for get-togethers over coffee. The sitting nooks defined by rugs and furnished with upholstered seating pieces and a slim table. For similar tiles, check out La Europa Ceramica, Booth 70 And 74 Ortigas Home Depot, Julia Vargas Ave, Ortigas Town Center, Pasig City. Find similar pieces at Habitat Manila, 3rd Level, Abenson (beside Ascott BGC Hotel), 28th Street and 4th Avenue, Bonifacio Global City, Taguig. 6. Plants serve as delightful accents. What better way to make the coffee shop even more relaxing than with a few green wonders? Aside from the plants placed on each table, there are also woven planters on the floor. To spruce up the ceiling, there are hanging planters holding flowering vines and blooms.